Autologous Blood Injection (ABI) harnesses the healing properties of blood in order to treat pain arising from tendons, ligaments and muscles. With excessive use and increasing age, pain arising from tendons is becoming more prevalent, particularly in active ‘baby boomers’. Prior to any proposed ABI, an accurate diagnosis must be made, which usually requires a test such as an MRI or ultrasound scan of the body part to confirm that the specific tendon, ligament or muscle is the source of the patient’s pain. Once referred for an ABI, the radiologist at Perth Radiological Clinic will then review the patient and discuss the ABI procedure and rehabilitation. ABI is most commonly used for the treatment of diseased tendons, commonly known as tendinitis. The medical term for this is tendinosis or tendinopathy. With increasing severity of tendinosis, partial thickness tears may form, which if left untreated can result in a full thickness tendon tear. Any tendon can be treated with this procedure and though not used routinely, the procedure may also be used in muscle and ligament tears (strains and sprains). The procedure of ABI involves withdrawing whole blood from the patient, usually taken from the patient’s elbow or forearm, and then injecting it into the area of maximal abnormality of the tendon using a machine called an ultrasound for guidance. Ultrasound guidance is used to ensure that the blood is delivered precisely and safely to the area concerned. Platelets, small cells found in blood which are involved in clotting, contain ‘alpha granules’ which release substances such as platelet derived growth factor (PDGF) into the tendon and commences a cascade of natural healing. Refrain from any significant activity involving the body part for one week. Necessary activities of daily living are permissible, but do not engage in any deliberate exercise, such as running, weight training or other sporting pursuits. A moderate amount of discomfort is expected due to the process of inflammation and is how the procedure provides benefit. Inflammation results in repair of the damaged tissues into which the blood has been injected, however, it may also cause swelling and pain. As such, paracetamol and a cool compress may help. If the pain is severe anti-inflammatory medications are particularly helpful. This pain flare is usually worse in the first three days following the procedure and slowly decreases. If you are concerned, please call our clinic to discuss your specific situation and our doctor will discuss this with you further. After the first week, you are advised to commence a three week program of rehabilitation under the supervision of a physiotherapist, concentrating on stretching and eccentric exercises. The rehabilitation is low intensity at the start, gradually increasing depending on your pain and general progress and is at the discretion of your physiotherapist. At this point, it will be four weeks following the injection (1 week rest followed by three weeks of a graduated rehabilitation and exercise program). If you have no more pain, then no further action is required. If your pain has decreased but pain remains, then a second injection is recommended. If you have had NO benefit , a repeat injection is recommended. There are many patients that only respond after a second injection. If a second injection is performed, then the rehabilitation program as for the first injection is repeated. If you have had relief at this point but pain persists, then a further injection may be performed. If you have had no benefit after this, then you are unlikely to respond to further injection. 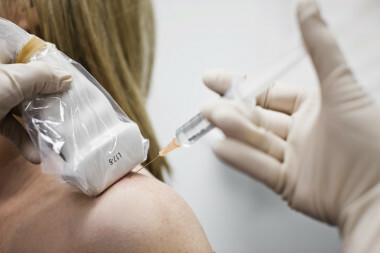 A different type of injection however may provide you benefit, such as platelet rich plasma injection (see www.perthradclinic.com.au for further information). Unfortunately, it is not possible to determine which patients will benefit from which type of injection. Perth Radiological Clinic uses blood products as its first line of treatment, based on recent studies published in the scientific literature that this will most likely provide you with pain relief. The doctors at Perth Radiological Clinic are available to discuss other radiologically guided procedures to treat your condition should you wish to pursue further treatment. The radiologist conducting the injection will send your referring doctor a report.